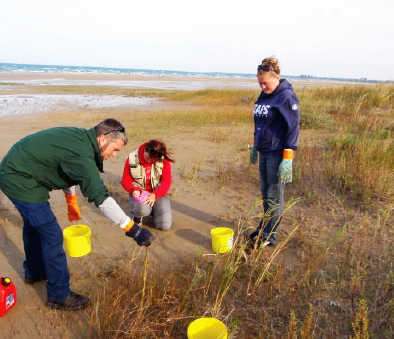 The Ontario Phragmites Working Group (OPWG) is composed of dedicated people with an interest in working together to facilitate effective management of invasive Phragmites in Ontario. This initiative is aimed at reducing the current threats posed by this aggressive invasive plant to biodiversity and Species at Risk through habitat protection and restoration. 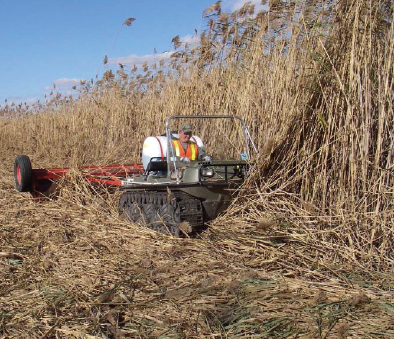 When attempting to manage and control invasive Phragmites, it is important to first determine if the plants you are managing are the native or invasive strain of Phragmites. The spread of Phragmites can be minimized significantly by gardening with non-invasive and native plants, “Looking Before You Leave”, and cleaning equipment when moving. Private landowners, lake associations, community groups, and private conservation organizations are leading the way to successful invasive Phragmites management. 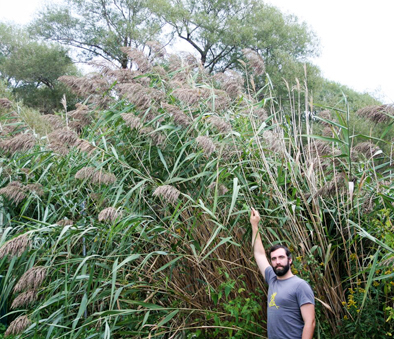 Invasive Phragmites is a tall, perennial, wetland plant. It grows in dense stands which crowd out native vegetation, resulting in decreased plant biodiversity and a poor habitat for wildlife, impacting species at risk. Stands of invasive Phragmites are composed of a high percentage of dead stems, which are dry and combustible, increasing the risk of fires. Invasive Phragmites can also negatively affect agriculture, lower property values, cause road safety hazards, and impact recreational activities such as swimming, boating, and angling. Do you have a project you would like to share with us? The Ontario Phragmites Working Group (OPWG) is composed of dedicated people with an interest in working together to facilitate effective management of invasive Phragmites in Ontario. This initiative is aimed at reducing the current threats posed by this aggressive invasive plant to biodiversity and Species at Risk (SAR) through habitat protection and restoration.